Bad breath is a problem that effects everyone at some point in their life. For some, it is a simple nuisance that occurs when they first wake up in the morning or after eating a meal heavy in onion, garlic or spices. For others, it is a chronic condition called halitosis that they may not even be aware they have. Either way, breath odor can keep friends, loved ones, and opportunities on the other side of the room. Below are some of the common causes of bad breath and some recommendations to keep it a bay. Something you ate. If a meal you ate just included onion, garlic, heavy spices, a lot of acidity, or fish, you may fall victim to short term bad breath. You drank some coffee, wine or smoked a cigarette. Alcohol, caffeine and tobacco are all known to create a double whammy of bad breath by coating the mouth, drying in, and breaking down into chemicals that can cause a malodor. 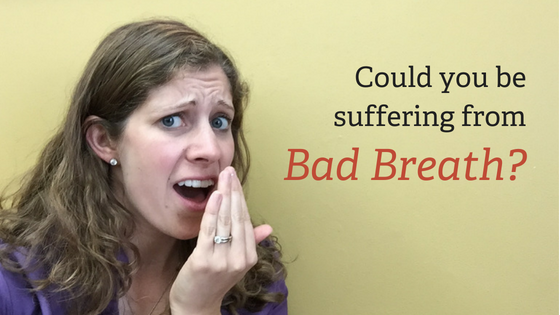 This type of bad breath will resolve when the food, alcohol, coffee, or other source is digested or broken down or when the mouth is re-hydrated. This can be sped up with proper brushing (don’t forget the tongue), flossing, mouth rinse, breath mints, gum, anti-acids (if a digestive odor), and drinking lots of water. As stated above, this type of odor is short term and will likely resolve on its own. In most of these instances the person is aware of a bad odor or taste and is motivated to improve upon it. A dental problem. Cavities, gum disease, cracked/broken fillings or teeth, or unclean dentures can all cause halitosis. High protein/low carb diets (such as a Keto or Atkins diet). As the high amounts of protein in your system break down (digest) they form ketones which can give off an acetone (nail polish remover) or urine like odor. A diet consistently heavy (1-3 meals a day) in garlic, onion, exotic spices, acid, coffee, alcohol and consistent heavy use of tobacco can all cause a more chronic halitosis. The medications you take. Common culprits include antihistamines, antidepressants, antihypertensives, anorexiants, anticolinergics, antipsychotics, anti-Parkinson agents, diuretics, asthma medications and sedatives. All of these medications can cause dry mouth also known as xerostomia. Also any combination of 3 or more medications regardless of type can also be linked to dry mouth and thus halitosis. When the mouth dries out it promotes a build-up of the “bad” odor causing bacteria and cavity causing bacteria in the mouth. Chronic Health Condition or Illness. Colds, allergies, sinus infections or throat/tonsil infections can all be the source of halitosis (especially if post nasal drip is involved or you are so stuffy you can’t breathe through your nose). Other chronic conditions such as diabetes, acid reflux, blood disorders, HIV/aids, Sjogrens syndrome, anemia, sleep apnea, cystic fibrosis, rheumatoid arthritis, Parkinson’s disease, Alzheimer’s disease, lung or kidney disease, and certain cancers can also be linked to bad breath. Halitosis will not go away with brushing, flossing, rinsing, or breath mints. The first step in reducing halitosis odor is to talk to your dentist, hopefully at Generations Dental, to rule out a dental problem. If halitosis is related to dry mouth (mouth breathing, medications, or medical condition) then drinking lots of water, using dry mouth aids, sugar free candy/gum, or sinus relief can help reduce the bad odor. Sometimes the dry mouth has caused an overabundance of the “bad” bacteria mentioned above. In these cases, an over the counter or prescription antibacterial mouth rinse, like the Carifree products we offer at our office, can be effective in reducing the malodor. If the odor is related to foods eaten or a weight loss plan, modifications to the diet can be made to reduce the odor. A physician can give tips to modify medically related halitosis. This may include taking antacids, controlling blood sugars, or changing medications to better control a condition. Bad breath can stem from a variety of sources, but is not something that you have to live with forever. If you are aware of or have been told about your own bad breath, try some of the solutions listed above or come to see us for a more personalized recommendation on how you can achieve fresh breath once again.